Ask questions, leave comments, vote in a poll, buy or sell astronomy equipment, or just say hi. BRAS is on Facebook too! How we’re fighting light pollution in B.R. Join BRAS with our downloadable form. We now accept online payment via PayPal! Don’t want to join, but do want to help? Or want to do more than joining? Now you can, online. Download or view past editions of our newsletter. Have us come to your group or event. See the closest pass of Mars♂ in 15 years! Dates and times for our BRAS Members only observing. Pictures taken by our members. Charts, Images, and Text to show what’s going on for a given month. Tiling and full screen wallpapers for your desktop. Welcome to the Baton Rouge Astronomical Society home page! This site contains links on the left to pages with astrophotos taken by our members, monthly observing information, past issues of our newsletter, and our forum. We also have links to dozens of other astronomy related sites on the Internet. We hope you enjoy your visit! visitors since counter reset on May 28th, 1999. Web site updated Thursday, April 18, 2019, 01:05 PM. 160th birthday of Vincenzo Cerulli (CDT). For information on events at the Observatory, please visit its Calendar of Events page. BRAS is an organization created and sustained by people who share a common interest in amateur astronomy. 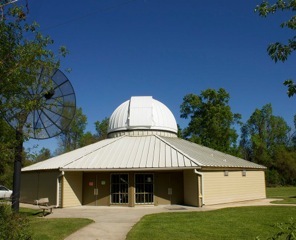 Established in 1981, and with about 88 members currently, BRAS is a meeting place for amateur astronomers in and around the Baton Rouge, Louisiana area. BRAS membership is a varied collection of individuals. Some members, new to amateur astronomy, are seeking to learn the basics such as, “How do I learn about the night sky? How does the solar system really work? What is a black hole? What is the best telescope for me? How do I get started in astrophotography?” Other members may be quite experienced in such areas as the visual night sky, cosmology, observing techniques, setting circles, astrophotography, optics, and telescope making. Most members, however, are amateurs with a love of the night sky who enjoy sharing their interest with others. Programs are varied and can cover many different topics. Films on solar system exploration and the Universe have been viewed and discussed. Exhibits of various astronomical charts, books, computer programs have been brought by members. Other activities include stargazing at the Highland Road Park Observatory and at a members only dark sky site. Participation in regional observing events, such as the Deep South Regional Star Gaze (Fall) and the Messier Marathon (Spring). Special programs for the members and the public such as Astronomy Day and Space Week. Members can participate in a wide variety of observing programs and awards offered by the Astronomical League, of which membership in BRAS entitles you to. If you would like to join BRAS, or would like to get some more information, use the link on the left. These pages may not appear correctly to you if your browser does not support HTML 4.01 formatting and CSS2.